Individually wrapped sterile gauze pads. Superior wet strength and very absorbent. First Aid use for cuts, burns and abrasions. Directions For Use: Properly cleanse wound area. 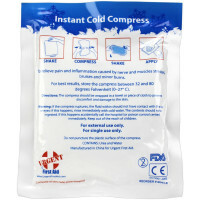 Carefully remove gauze pad from packaging, limited excessive contact with pad to avoid contamination. Apply pad to wound area and secure in place. Change bandage daily. The Prostat First Aid 2” x 2” Sterile Gauze Pads, 25/BX.